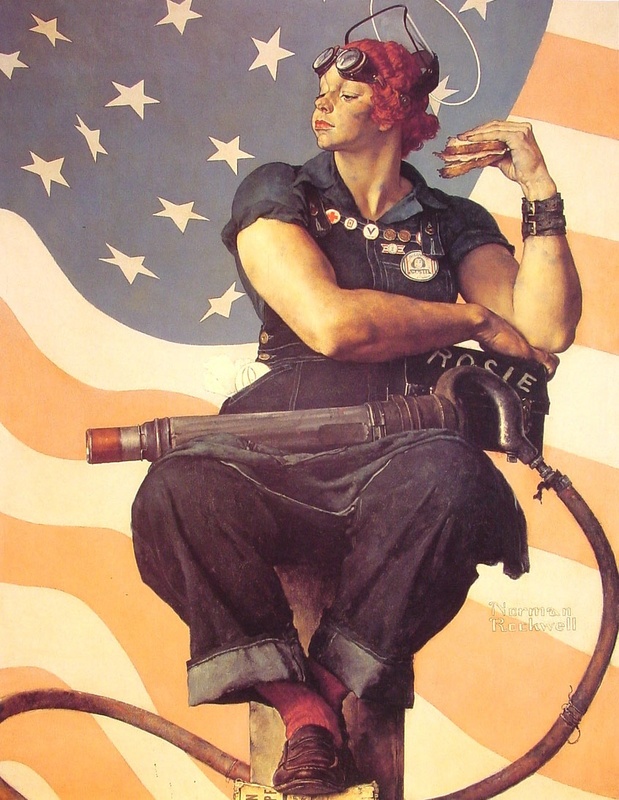 I’ve always liked “Rosie the Riveter,” the iconic WWII figure famously portrayed in this painting by Norman Rockwell. Years ago, I had a copy of this print in my office. Rosie symbolized the thousands of women in industrial jobs who replaced men gone to fight. She embodied the spirit of a new phase in American life. I look at her and I see Resolve. Tenacity. Perseverance. Strength. Courage. And I know that under her tough-as-nails exterior, she was also tender and womanly. To convey her feminine charms, some artists even portrayed her with noticeably red lips. I can relate to Rosie’s “taking care of business” attitude, and I suspect that most American women do. But I also wonder about her quieter moments. The ones where she kept her home together. Held her kids. And perhaps marveled about the way thousands of little bolts can hold one big vehicle together. I have a riveting gun too, you see. It’s just invisible. Its’ bolts are tiny interactions, layered one on top of another over months and years until hopefully, finally, in the end, my contributions will have aided in the creation of a self-sufficient and loving adult. Three of them, in fact. At least, this is what I envision. I get so consumed with trying to make sure that everything is powered down and in place that I can forget the beautiful whimsy of working on long-term projects that are large, grand, and so very, very important. And also so very different, complicated, and not “projects” at all – but God-given gifts who are entrusted to me (and my husband) for a time. I can fail to really see each one of them at all. That is, until I experience a moment like the one I experienced tonight. Because – let’s face it – my kids’ growing up experience isn’t just about them, is it? It was all normal enough – laying out my son’s clothes for school tomorrow. Except that tomorrow is his last day of kindergarten. My baby’s last day of kindergarten. His navy blue shorts and white shirt suddenly looked so, so small. A metaphorical hammer was coming down on my head as I realized he wouldn’t fit into these clothes come fall. They are already tight, and he’s our last child. I stood there. Suddenly fighting to breathe. I ran to his bed, where he lay, silently sleeping. I stroked his hair. Touched his cheek. Held his hand. Wiped tears from my face with the back of my other hand. There were so many projects I had planned to do this year while he was spending days in kindergarten. Some got done. Others didn’t. And? No one was keeping score. But like Rosie, I was doing the work of a new phase in my own life. Invisible rivets. Laying down the foundation for what will be when he finishes 1st grade, and 2nd, and 12th, and so on. A new phase means changing some things and building on others. Look ahead with Resolve and Courage. Be Riveted to Hope.